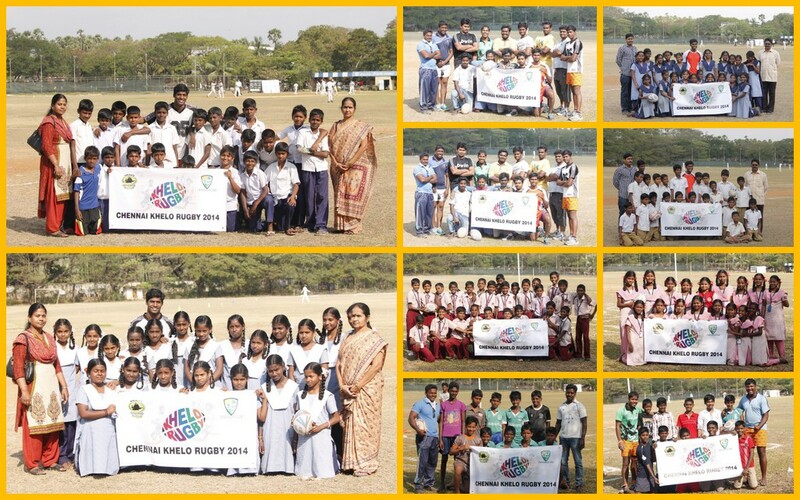 Our mission was to re-energise our Khelo Rugby programme in Chennai and in March we did just that, working hard to put together a first girls and boys tournament with over 160 children participating in eight boys and six girls teams under the scorching Chennai heat. To organise the whole event took us ten days of tough work and the days seemed sometimes years but the boys from Chennai Irish RFC who are our partners for Khelo Rugby made it all so much easier. In the end we launched 4 schools and 2 communites under Khelo Chennai. Accompanied by my mad co-worker and Khelo Head Coach Nanda Majhi together we travelled down by train from Kolkata and got straight to work with the Chennai team. From day one the Chennai guys were really hospitable and showed us how to get by in what is a very different city from our home town of Kolkata. In the first two days we visited over a dozen boys and girls schools but the response from each was not so enthusiastic, especially with exams around the corner. With perserverance though we managed to sign up four co-education schools, one far village and one fishermen’s community one after the other and now things looked more relaxed. We decided Monday morning was going to start 24/7 of only coaching tag rugby for the next five days to hundred and sixty children. We cracked on with our job , three sessions in a day, over twenty km covered every day, no lunch and breakfast at times, arguments and some time the best of jokes out of the blue made it a week with lots of learning. We have always said that yes Khelo is a great tool to develop any kind of sport but what we believe in is much more than that. Every time we step into a new challenging environment with the intention of touching children’s lives with good sport and fun. This has turned out to be such a rewarding experience for us, the communities involved and more important to the children involved. I would like to share the story of young Shraavan Thiruvonam (who we all called HEART boy) who comes from a lower middle class family. I am not going to sing a story about how poor he is and how great we were to give him the opportunity to play tag rugby. He is not the guy I would want in my team, he was skinny as a stick, quiet as a mouse and had a major heart operation just six months ago. For the first two days that we visited his school he just sat on the bench watching us. On the third day while we were practicing the ball rolled out of the ground and towards him. I looked at him and asked him to throw me the ball, he picked it up and instead of throwing it to me he came running to me and handed it over as he said, “just because I have a heart problem does not mean I cannot be in the school team”, I replied “I never said you cannot be in the team” the next thing was a big heart smile on his face. At the back of my mind I had a fear about him playing but I think I could see the strength in his little heart which gave me the courage to let him play. I have to admit he did not do a Johnny or Serevi (two greats of rugby) but he was a team man. At the end of the tournament everybody knew him as HEART boy. In Khelo we believe in the inner strength of children. In our lives we have all experienced the feeling of being suppressed or put down by someone or other, telling us we are not good and we cannot do it. Our challenge is to show the youth of this country that they can make changes even change the country by their own determination, faith and belief. Children from all over the city traveled to the T-day. The coaches had their teams ready, whistles warmed up, the ground was prepared, trophies ready, colorful bibs on and the whistle blew hard as we started the tournament. Girls and boys team playing simultaneously on two pitches it was fast feet, quick hands and lot of passion from the children in trying to get their hands on the silverware for their respective schools and communities. Olcott School prospered in the end, an original Chennai Irish Khelo location with both of the girls finalists and winning a super game in the boys final versus Minjur. All the pictures are here. We’ve now appointed Ravi to work part time between his studies as a Coach in Chennai, he is a great young man with a good future and we hope to be able to support him as he develops. As we settle into a routine let’s see how else we can develop and support the Chennai Khelo team and our partners the ‘supermen’ of Chennai Irish RFC. We want to involve their players more and more in the community, both to support growing their team but also to help them as they develop and grow as young people. For myself and Nanda this was another brilliant experience, out of our comfort zone, facing challenges, working with new people – Khelo really does change lives and not always the ones you think you’re changing!